Protective clothing or protective textiles are one of the parts of technical textiles which are used principally for their performance or functional properties rather than their decorative or aesthetic properties. Protection from extreme environmental situation has always been a crucial requirement of textile products. To protect human beings or atmosphere from various natural or industrial hazards, protective clothing or protective textiles are vastly used. There are some possible environmental hazards namely heat, cold, wind, ultraviolet radiations, snow, radioactive radiations, rain, abrasion, dust, micro-organisms, static electricity etc. Some prominent industrial or human hazards are fire, industrial chemicals, biohazards, flash, high-velocity projectiles, cutting or slashing by sharp objects etc. when we are in the vicinity of one or more of those, we need optimum safety from all those hazards. Thus the need for protective textiles is there to safeguard us. 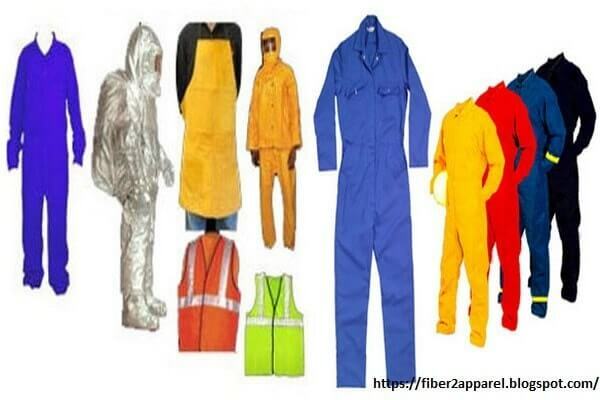 What Types of Fiber Used in Protective Clothing? Industrial protective clothing, Racing driver’s suit, Filter bags for hot gas, Cargo covers, Boat covers, Fire hose reinforcement. Tyre cords, Radiator hose and brake shoes of racing cars, Body armor, Reinforced composites for aircraft, High-speed boat components. Aircraft and a Space shuttle, Automotive, Medical Implants, and Marine. Consumer goods, Roofing Tiles, Corrosion resistant products used in highway overlay, Aircraft, and aerospace. Marine ropes and cables, Sailcloth, Protective clothing, Boat hulls. Foundation garments, Support hose, Sports and leisure garments. Hot gas filtration, Thermal protective clothing, Racing driver’s suit. Filtration media for the oil industry, Medical Textile, Industrial fabric. Aircraft, Automobile, Sport, Electrical Application and Military Application. Filtration media for corrosive material, Refrigeration, Packing Material.